Digital Hybrid technology digitizes the audio signal at the transmitter end. The signal is then converted to analog at the receiver, eliminating analog compandor circuitry. The result is accurate transmission with great range, without noise caused by analog compandors. SmartTune automatically scans for usable frequencies within the systems frequency block. Incoming radio frequency level and rate is carefully analyzed in order to determine the optimum timing for phase switching. The result minimizes drop-out and radio frequency interference. 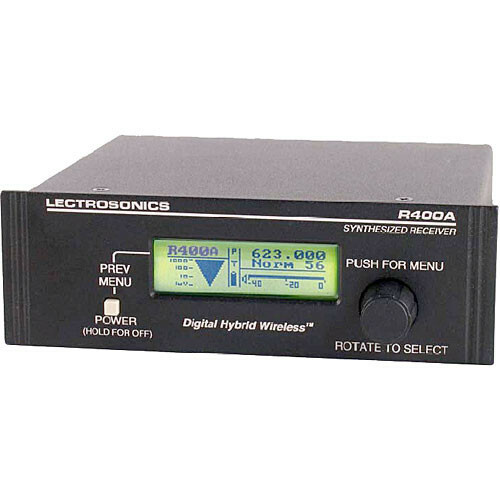 The R400A utilizes microprocessor components, attributing to it's small size. The optional RMPR400-1 / RMPR400-2, rack mount kits enable mounting single or dual units into a 19-inch single rack space. Box Dimensions (LxWxH) 14.0 x 10.5 x 4.0"